Human kidney injury molecule-1 (hKIM-1) is a type 1 transmembrane protein that is not detectable in normal kidney tissue but is expressed at high levels in human and rodent kidneys with dedifferentiated proximal tubule epithelial cells after ischemic or toxic injury. Therefore, it was hypothesized that renal tumors express hKIM-1 and release this protein into the urine. Forty renal cell carcinoma (RCC) and 484 nonrenal tumors were analyzed by immunohistochemistry for expression of hKIM-1 (group 1). Urine samples before nephrectomy and nephrectomy tissue samples were collected from an additional 42 patients with renal tumors, from 30 normal control subjects, and also from 10 patients with prostate carcinoma (group 2). In five additional patients with RCC, urine was collected before and after nephrectomy (group 3). Tissue was examined for expression of hKIM-1, and cell-free urine supernatants were analyzed for hKIM-1 by ELISA. Urinary hKIM-1 was normalized to the urinary creatinine concentration (UCr). Expression of hKIM-1 was present in 32 tissue sections (91%) of 35 clear cell RCC (group 1). In group 2, the normalized urinary hKIM-1 levels were significantly higher in patients with clear cell RCC (0.39 ± 0.08 ng/mg UCr; n = 21), compared with levels in patients with prostate carcinoma (0.12 ± 0.03 ng/mg UCr; P < 0.02; n = 10), or normal control subjects (0.05 ± 0.01 ng/mg UCr; P < 0.005; n = 30). Tissue sections from 28 (82%) of 34 primary RCC stained positively for the expression of hKIM-1. In all patients with a detectable prenephrectomy urinary hKIM-1 level, there was either complete disappearance or marked reduction after nephrectomy (group 3). In conclusion, the cleaved ectodomain of hKIM-1 can be detected in the urine of patients with RCC and may serve as a new biomarker for early detection of RCC. The incidence of renal cell carcinoma (RCC) has been increasing 2 to 4% per year since the 1970s, perhaps related in part to the improvement in and increased use of modern imaging techniques (1). Limited early warning signs result in late recognition with metastases present in approximately one third of patients at the time of diagnosis (2, 3). The most common type of RCC is clear cell type, which accounts for 70 to 80% of adult renal neoplasms (4, 5). There are currently no reliable and easily performed screening technologies for RCC. The diagnosis of RCC by computed tomography, magnetic resonance imaging, and ultrasonography has been incidental in most cases (1). Relying on imaging technologies for early screening, however, is impractical and costly. The most important determinant of survival for the patient with RCC is the anatomic extent of the tumor. The availability of a sensitive biomarker for screening of RCC and detection of the tumor at a point before metastases could considerably improve the prognosis of RCC. Human kidney injury molecule-1 (hKIM-1) is a type 1 cell membrane glycoprotein that, in both humans and rodents, is expressed when the injured renal proximal tubule assumes a dedifferentiated phenotype (6). KIM-1 is also known as hepatitis A virus cellular receptor 1 and T cell Ig- and mucin-domain–containing molecule 1 (7–9). We reported previously that rodent KIM-1 is strongly upregulated in proximal tubular epithelial cells in various states characterized by epithelial cell dedifferentiation: Ischemia, toxic renal injury, and polycystic kidney disease (6, 10, 11). Furthermore, its ectodomain is released into urine and hKIM-1 is a sensitive urine marker for proximal tubule injury (12). Urinary hKIM-1 is not detectable in normal individuals without any renal disease (12). An elevation of urinary hKIM-1 suggests an ongoing renal pathologic process resulting in dedifferentiation of proximal epithelial cells, which warrants further evaluation of the patient for kidney disease. RCC shares many cell surface markers with renal tubular cells. Clear cell and papillary RCC are considered to be derived from proximal tubular cells, whereas other renal tumors such as chromophobe, oncocytoma, and collecting-duct carcinoma are believed to arise from either distal tubular or collecting duct cells (3, 13–16). We hypothesized that dedifferentiated epithelial cells characteristic of RCC would express hKIM-1 and that hKIM-1 would be released into the urine and possibly serve as a biomarker for RCC. Human nephrectomy tissue sections from 40 patients with a confirmed diagnosis of RCC (group 1), tissue collected from 34 randomly selected nonrenal primary tumors, and 450 nonrenal tumors on multitumor tissue microarray slides were obtained and evaluated for expression of the hKIM-1 protein by immunohistochemistry. Tumor specimens were obtained from either Massachusetts General Hospital or Dana-Farber Cancer Institute, (Boston, MA). Urine samples from these patients were not available. The tissue arrays were obtained from the Cooperative Human Tissue Network under the Tissue Array Research Program (TARP) of the National Cancer Institute, the National Institutes of Health (Bethesda, MD). TARP4 array slides consist of well-characterized central nervous system tumors; lymphoma; melanoma; and ovarian, breast, colon, lung, and prostate cancer. In another set of patients (group 2), both tissue and urine specimens were collected. Primary renal tumors were diagnosed by radiologic studies and/or by renal biopsy. This diagnosis was confirmed later by independent review by renal pathologists after nephrectomy. Urine samples were collected on the day of surgery from 42 patients with renal neoplasms before elective nephrectomy at Massachusetts General Hospital from April 2002 to June 2003. Tissue samples from each of the 42 patients with primary renal tumors were evaluated by immunohistochemistry for expression of hKIM-1. Furthermore, pre- and postnephrectomy urine samples were collected from a subset of patients with RCC (n = 5; group 3). Postnephrectomy urine samples were collected 4 to 6 wk after nephrectomy. Urine specimens were also obtained from 30 normal control subjects with normal renal function and without any previous renal disease. 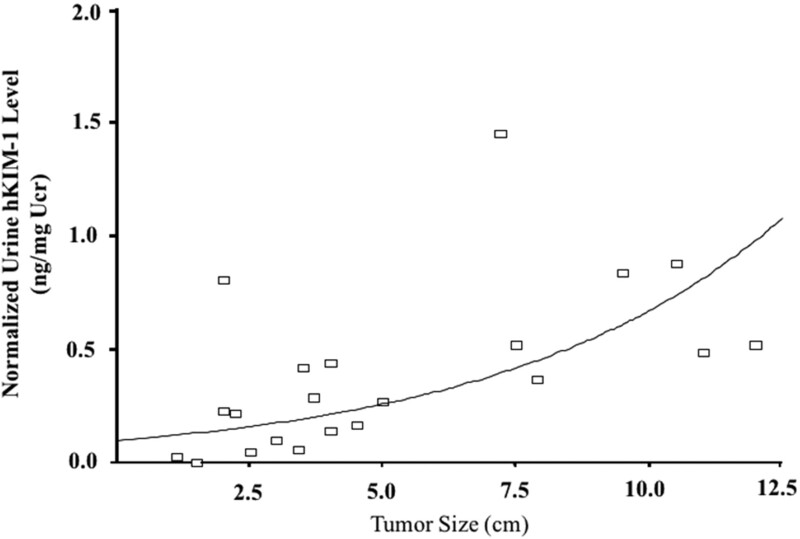 Gender, tumor sizes after resection, and serum creatinine were obtained from the review of patients’ records. Tumor staging was carried out according to the 1997 Tumor, Nodes, Metastases (TNM) stage classification (17), and RCC type classification was according to the Union Internationale Contre le Cancer and the American Joint Committee on Cancer (18). The study protocol was approved by the institutional review board of the Massachusetts General Hospital. To investigate the specificity of hKIM-1 as a RCC tumor marker, urine samples were collected on the day of surgery from 10 patients with prostate carcinoma before elective prostatectomy at Massachusetts General Hospital. Tissue samples from each of the 10 patients with primary prostate carcinoma were evaluated for expression of hKIM-1 by immunohistochemistry. Collected fresh urine samples were centrifuged to remove cellular components, and protease inhibitor cocktail tablets (1 tablet/10 ml urine supernatant) (Boehringer Mannheim, Mannheim, Germany) were added immediately to the transferred supernatant. Urine analyses, including urinary dipstick (Multistix 8 SG; Bayer Corporation, Tarrytown, NY) and microscopic examination of sediment, were performed before storage at −80°C. Highly specific murine mAb were raised against the extracellular domain of hKIM-1 and were purified as described previously (19). Monoclonal antibodies (mAb), designated AWE2 and AKG7, were used for this study. AWE2, which recognizes the native protein and binds to the Ig-like domain, was used as a trapping antibody for immunoextraction and ELISA. The AKG7 antibody, which also binds to the ectodomain, was labeled with biotin using the sulfo-NHS-biotin (Pierce Chemical Co, Rockford, IL) and was used as detection antibody for immunohistochemistry and ELISA. The mAb to a proximal tubule renal antigen (RCC marker [RCC-Ma]), a 200-kD glycoprotein (20), was obtained from Vector Laboratories (Burlingame, CA). Human formalin-fixed, paraffin-embedded kidney sections of nephrectomy (renal primary tumors), nonrenal primary tumors, and TARP4 slide sections that contained various human tumor tissues were deparaffinized, and endogenous peroxidase activity was ablated by incubation in 2% hydrogen peroxide in methanol for 20 min. The sections were heated in a microwave oven in 0.1 M citrate buffer (pH 6.0) for 10 min and were blocked with 1.5% horse serum in PBS at room temperature for 1 h. After 50 μl of AKG7 anti-human hKIM-1 mAb at 0.2 μg/ml in blocking solution was added to the sections, they were incubated overnight at 4°C. hKIM-1 was detected using a commercially available Vectastain Elite ABC kit (for mouse IgG) with DAB Substrate (Vector) kit for peroxidase staining. The sections were counterstained with hematoxylin. We used the noncancerous unaffected portion of the kidney distant from the tumor as an internal control along with negative control tissue sections to confirm the positive staining. All tissue section staining was done in parallel with a negative control, in which the primary antibody (AKG-7) was replaced with mouse IgG. The staining was reviewed independently by three of the authors (W.K.H., A.A., and W.C.I.). The positive staining pattern was tabulated, and the percentage of stained tumor cells was obtained by visual quantitation and was classified as 1+ (<10% of tumor staining for hKIM-1), 2+ (between 10 and 49% of tumor staining for hKIM-1), and 3+ (>50% tumor staining for hKIM-1). Staining for hKIM-1 was compared with staining with the RCC-Ma antibody, which has been used in the tissue diagnosis of RCC (21). For immunostaining using RCC-Ma antibody (Vector Laboratories), sections were treated with trypsin in 6.8 mM calcium chloride for 30 min at 37°C at pH 7.8 as per the manufacturer’s recommendation, rather than heating in a microwave oven. Urinary soluble hKIM-1 protein was detected by immunoextraction followed by Western blot analysis and was quantified by ELISA as previously described with modification (12). Briefly, the wells of an ELISA plate (MaxiSorp; Nunc, Naperville, IL) were coated with AWE-2 antibody (overnight incubation at 4°C with 200 μl of diluted AWE-2 at 6.5 μg/well in PBS). Each 1 ml of urine sample was concentrated by centrifugation using a Centricon tube (Millipore, Bedford, MA) at 9000 rpm for 30 min at room temperature. Wells were blocked with a BSA solution (1% in PBS) and were washed four times with PBST (PBS with 0.05% Tween 20). For immunoextraction followed by Western blot analysis, the wells were incubated with concentrated urine samples (200 to 250 μl) at room temperature for 3 h. After four washes with PBST, samples were mixed with 25 μl of Laemli loading buffer that contained 5% β-mercaptoethanol and heated for 5 min at 95°C. Twenty microliters of this solution was subjected to SDS-PAGE (10% polyacrylamide gel), and the proteins were transferred onto Immobilon-P membranes (Millipore, Bedford, MA). The blot was blocked with a 5% nonfat dry milk solution in PBST. The membrane was incubated with AKG 7 antibody and then horseradish peroxidase–conjugated goat anti-mouse IgG antibodies. Proteins were visualized with an enhanced chemiluminescence detection system (PerkinElmer Life Sciences, Boston, MA). For ELISA, after four washes with PBST, biotinylated AKG7 antibody was added, followed by horseradish peroxidase–conjugated streptavidin and tetramethylbenzidine as substrate. We calculated both absolute (nonnormalized) urinary hKIM-1 and normalized hKIM-1 in our study. We normalized urinary hKIM-1 to the spot urinary creatinine concentration (UCr) to compensate for the differences in relative amounts of water removed along the nephron. The intra- and interassay variances were 9.4 and 12.9%, respectively. Serum and urine creatinine concentrations were measured by the Jaffe assay using Roche/Hitachi 917 and 911 systems (Roche Diagnostics, Indianapolis, IN), respectively. Categorical variables were analyzed using χ2 tests, and continuous variables were analyzed using Mann Whitney U tests. Logistic regression was used for multivariate analysis, and all P values are two tailed. Statistical analysis was performed using SAS software (SAS Institute, Cary, NC). Data are expressed as means ± SE. The expression of hKIM-1 was evaluated in 40 nephrectomy samples (group 1) in which a renal tumor was identified. hKIM-1 is expressed in a large proportion (91%) of clear cell RCC (Table 1). A representative staining pattern for clear cell RCC is demonstrated in Figure 1. Even when renal tumor cells did not stain with hKIM-1 antibody, adjacent tubule cells were usually positive. hKIM-1 was not present in glomeruli and noncancerous tubulointerstitial regions in the unaffected portion of the kidney distant from the tumor. Staining for hKIM-1 was compared with RCC-Ma antibody staining. RCC-Ma is expressed in proximal renal tubules in both normal and RCC kidney tissues. 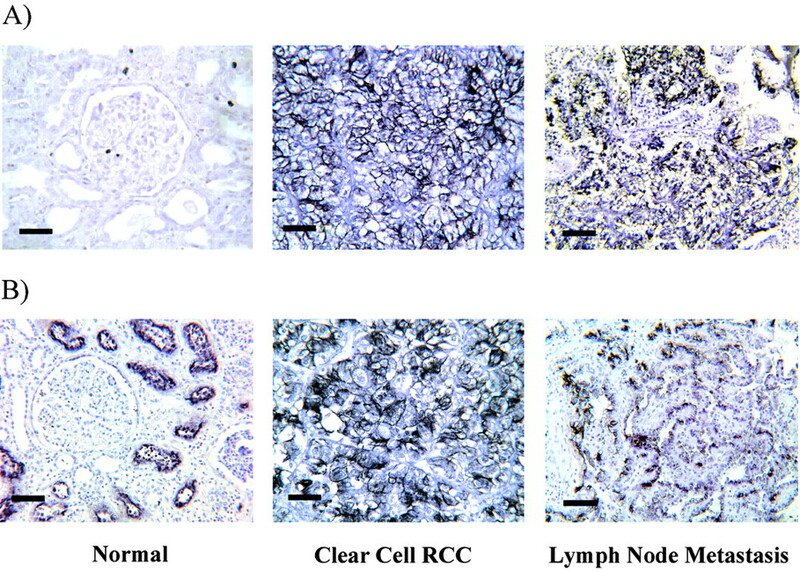 Human kidney injury molecule-1 (hKIM-1) and renal cell carcinoma marker (RCC-Ma) expression in RCC human kidney and lymph node metastasis. 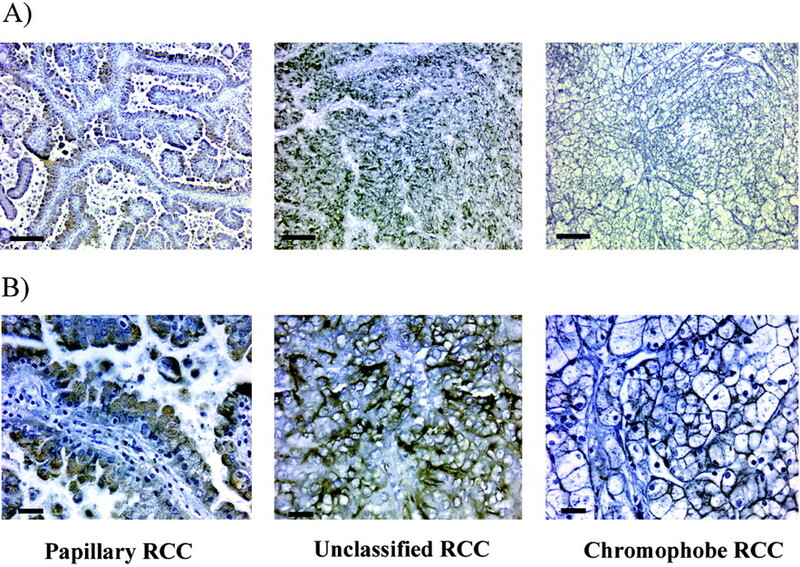 Normal kidney, clear cell RCC, and lymph node metastasis paraffin sections are stained for hKIM-1 (A) using AKG7 anti–hKIM-1 antibody and RCC-Ma (B) using RCC-Ma mAb. Immunoreactivity was detected with an ABC peroxidase detection system with DAB substrate (Vector). Bars = 50 μM. In this study, 34 randomly selected nonrenal primary tumors and 450 nonrenal tumors on TARP4 slides were evaluated for specificity of hKIM-1 staining for RCC. All were negative, except for one of two cases of hepatocellular carcinoma. In no case did we find hKIM-1 staining in normal tissue adjacent to a nonrenal tumor. Tissue and urine samples were available from 42 patients with renal tumors (group 2). Clinical characteristics of all patients from whom urine was evaluated for the presence of hKIM-1 are reported in Table 2. Among 42 patients, 31 patients had stage I, five patients had stage II, four patients had stage III, and two patients had stage IV renal cell tumor. The eight of 42 patients with renal tumors other than RCC had stage I disease. The other renal tumors include oncocytoma, transitional cell carcinoma of renal pelvis, and angiomyolipoma. An additional 10 patient with prostate carcinoma, having either stage I or stage II disease, were also studied. None of the patients with renal tumors or prostate carcinoma had casts or tubular cells in the urine. A few patients with renal tumors or prostate carcinoma had nondysmorphic microscopic hematuria. All normal control subjects had otherwise benign urine sediment microscopic examinations and normal renal function at the time of urine collection. RCC-Ma antibody is a proximal tubule cell marker and has been used for the tissue diagnosis of proximal tubule cell–derived renal tumors (20, 21). We compared the staining patterns with anti–hKIM-1 antibody with those using anti–RCC-MA antibody. We found that both hKIM-1 and RCC-Ma are sensitive markers for proximal cell–derived renal tumors (clear cell and papillary). The summary of staining for hKIM-1 and RCC-Ma by tumor type is presented in (Tables 3 and (4, and representative staining patterns for clear cell and non–clear cell RCC are presented in Figures 1 and (2, respectively. Even when the renal tumor cells did not stain with hKIM-1 antibody, adjacent tubule cells were usually positive (four of six clear cell RCC, seven of 14 non–clear cell renal tumors). This finding may reflect early tumor changes in proximal cells not clearly identified as part of the tumor or the presence of ischemic (12) or obstructive tubular injury (11) from compressing tumor cells. Overall, 19 (90%) of 21 clear cell RCC and 28 of the entire group of 34 (82%) primary RCC tissue sections stained positively for expression of hKIM-1 within the tumor and/or adjacent tubule cells. None of the eight other renal tumors stained positively in the region of morphologically abnormal tumor cells, but five of eight of these had hKIM-1 staining in cells adjacent to the tumor. hKIM-1 and RCC-Ma were expressed in a lymph node metastasis in the two patients whose primary tumor stained positively (Figure 1). hKIM-1 expression in non–clear cell RCC. Papillary, unclassified, and chromophobe RCC paraffin sections are stained for hKIM-1 using AKG7 anti–hKIM-1 antibody. Immunoreactivity was detected with an ABC peroxidase detection system with DAB substrate (Vector). Bars = 80 μM (A) and 20 μM (B). Western blot analysis revealed urinary hKIM-1 in samples from patients with clear cell, papillary, or chromophobe RCC (Figure 3). Urine samples from normal subjects and from patients with other forms of renal tumor, which had negative staining of tumors and adjacent tubule cells for hKIM-1, were also negative for urinary hKIM-1. Using ELISA to quantify urinary hKIM-1, both absolute (nonnormalized) urinary hKIM-1 concentration and normalized hKIM-1 (ng hKIM-1/mg urine creatinine) were greater in patients with clear cell RCC than in patients with other forms of renal tumors and normal patients (Table 5). The urinary hKIM-1 values for each of the patients are presented in Figure 4. The levels of urinary hKIM-1 are presented according to the tissue staining pattern with hKIM-1 antibody (Table 6). To evaluate the specificity of hKIM-1 in other genitourinary cancers, we measured the urinary hKIM-1 level in patients with prostate carcinoma. The hKIM-1 levels were significantly lower in urine samples from patients with prostate carcinoma compared with samples from patients with clear cell RCC (Figure 4). All 10 prostate tissue sections were negative for hKIM-1 protein expression. Western blot analysis of urine collected from patients with various renal tumors. Each lane represents protein immunoextracted from urine of patients with various renal tumors or normal control subjects. After immunoextraction and PAGE, Western blot analysis was carried out with the AKG7 anti–hKIM-1 antibody. TCC, transitional cell carcinoma. Comparison of urinary hKIM-1 levels in primary renal tumors and prostate cancer. Scattergram of normalized urinary hKIM-1 levels in clear cell and non–clear cell renal carcinoma as well as patients with prostate cancer and normal control subjects is shown to compare hKIM-1 concentration among different primary renal and prostate tumors. The number of patients in each group is indicated. We determined whether potential confounding variables explained the association between normalized urinary hKIM-1 concentration and RCC. After adjusting for age, a cut point of >0.1 (90th percentile in the control population) in urinary hKIM-1 was associated with a >36-fold risk for having clear cell RCC (odds ratio, 36.6; 95% confidence interval, 6.4 to 208.6). A urinary hKIM-1 level >0.1 has a sensitivity of 82% and a specificity of 90% in all patients with clear cell RCC. In group 2 there are two patients with clear cell RCC and seven patients with non–clear cell renal tumors in which tissue expression of hKIM-1 could not be detected in either tumor cells or adjacent tubule cells (Table 3). All of them were stage I renal tumors, and the mean tumor size was 2.6 cm (range, 1.6 to 4.0 cm). There is a strong positive correlation between tumor size and level of shed urinary hKIM-1 (P < 0.005) in clear cell RCC (Table 7). The scatter plot of urinary hKIM-1 levels and clear cell tumor sizes is presented in (Figure 5. 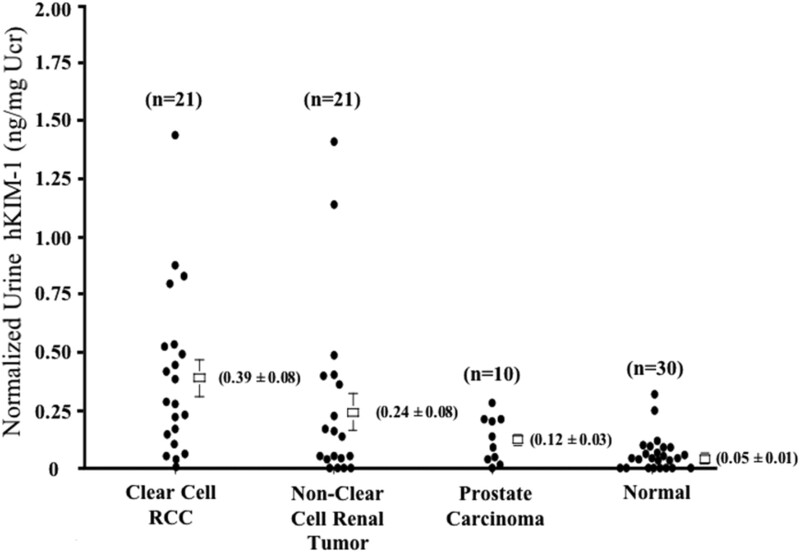 Correlation between tumor size of clear cell RCC and normalized urinary hKIM-1 levels. To determine whether nephrectomy affects an elevated prenephrectomy urinary hKIM-1 level in patients with RCC, we compared the pre- and postnephrectomy urinary hKIM-1 levels in five new patients who had RCC and underwent nephrectomy (group 3). In each, there was positive tissue staining for hKIM-1. Four of these patients had elevated prenephrectomy urinary hKIM-1 levels (Table 8). Both postnephrectomy absolute and normalized urinary hKIM-1 concentrations were close to undetectable except for one patient (patient 4), who has underlying renal amyloid disease. Even in this case (patient 4), there was a significant reduction of urinary hKIM-1 level as a result of nephrectomy. One patient with clear cell RCC (patient 1) had undetectable pre- and postnephrectomy urinary hKIM-1 levels. Our data indicate that hKIM-1 is expressed in a high proportion of clear cell RCC and that urinary hKIM-1 is elevated in patients with renal primary tumors of all stages (1–4). Furthermore, tissue expression of hKIM-1 can be detected in lymph nodes to which the tumor has metastasized. Tumors that are found at an early state are typically small, and surgical resection is likely to be curative (22); however, many tumors are diagnosed late in their course, when they are metastatic, because they are often asymptomatic until this point. A noninvasive biomarker would be useful in helping to make the diagnosis without relying on serendipity of incidental imaging studies. There have been two main approaches to the search for RCC tumor markers. One approach involves a search for specific RCC antigens. In the other, levels of expression of molecules that participate in major metabolic pathways are compared with their levels in normal cells. Antigenic markers such as RCC-Ma are specific for proximal tubule cells but do not distinguish malignant cells from normal cells and require tissue for analysis (21). Another proposed marker, MN/C9 antigen, is detected with the mAb G250; however, it is not known whether this antigen is expressed in early stages of the disease or whether it is specific for RCC (23, 24). Other mAb that are specific to kidney have limitations because they lack specificity for RCC and/or require tissue specimens (25). Similarly, prostate-specific membrane antigen, tissue polypeptide–specific antigens, and cytokines have been described as expressed in RCC but either show low specificity or are expressed at late stages of the tumor (26–28). In searching for intermediates of major metabolic pathways, an isoenzyme of pyruvate kinase has been suggested as a biomarker; however, enzymatic levels are variable and have a low sensitivity for nonmetastatic RCC (29–31). Vinculin, human chorionic gonadotropin-β, nuclear matrix proteins, metallothioneins, serum ferritin, matrix metalloproteinase activity, and many other proteins that are upregulated in tumor progression have also been suggested as markers (32–37). These markers, however, have not proved useful in the clinical treatment of RCC patients because they lack specificity for RCC and/or require tissue. Furthermore, cytogenetic and molecular studies have suggested frequent genetic abnormalities. Identification of these abnormalities in RCC, including microsatellite instability and DNA methylation (38–41), have been suggested as potentially helpful in diagnosis and clinicopathologic classification; however, they all require tissue samples, which limit their clinical use as an RCC marker. We have observed that hKIM-1 is a sensitive urine marker for proximal tubule injury (12). Our laboratory has also reported that a soluble form of cleaved hKIM-1 is shed into the culture media of human renal tumor cell lines, which express hKIM-1 under normal culture conditions (19). In the current study, hKIM-1 is expressed most often in clear cell RCC, and, when expressed in tissue of the tumor, a soluble shed hKIM-1 can be detected in the urine. One of eight chromophobe RCC expressed hKIM-1 in tumor cells (Figure 2). Oncocytoma, transitional cell carcinoma of renal pelvis, and angiomyolipoma did not express hKIM-1. Chromophobe RCC is believed to derive from the distal nephron. There may be certain circumstances in which abnormal distal cells change their phenotypic characteristics to express proximal tubule markers. In this context, it is interesting that dog MDCK cells, which are believed to derive from distal tubules, express KIM-1 in culture when dedifferentiated (unpublished data). Low levels of urinary hKIM-1 are present in patients with prostate carcinoma. Mild elevation of urinary hKIM-1 levels in the prostate carcinoma group may be secondary to the presence of obstruction, which is not detectable with the insensitive test of serum creatinine or current imaging modalities. In unpublished studies, we have found that obstructive nephropathy can result in KIM-1 expression in animals. Even when the RCC tumor cells are negative for hKIM-1 staining, adjacent tubule cells usually stain with hKIM-1 antibody. It is possible that this expression is related to the presence of tubular injury from compressing tumor cells. Alternatively, it is possible that these adjacent cells are not normal but represent an early stage of disease. Recently, hKIM-1 was implicated in immune responses that regulate the development of autoimmune and allergic diseases (9, 42). RCC has been considered to be an intrinsically immunogenic tumor (43). Therefore, it is possible that hKIM-1 plays an important role in modulating the immunogenicity of RCC. On the basis of current data, we believe that the level of urinary hKIM-1 is dependent on the following factors: (1) intensity of positive hKIM-1 staining of tumor cells, (2) size of the tumor, and (3) degree of positive staining of adjacent tubule cells. We had two cases of clear cell RCC that had positive hKIM-1 staining of tumor cells along with a positive staining of adjacent tubule cells but had no detectable urinary hKIM-1 level (<0.03 ng/mg UCr). Tumor sizes were 2.5 and 1.5 cm (stage 1), respectively. By contrast, we had a case of clear cell RCC that had no hKIM-1 staining of tumor cells but with positive staining of adjacent tubule cells in which urinary hKIM-1 was elevated (0.52 ng/mg UCr), and tumor size was 12 cm. In addition, we had several cases of RCC that had a very strong hKIM-1 staining of tumor cells, with tumor size between 2 and 4 cm, and had a high level of urinary hKIM-1 (>0.5 ng/mg UCr). There seems to be a positive association between the level of urinary hKIM-1 and the size of the tumor. However, further studies are necessary to determine the value of hKIM-1 for molecular staging or prognosis. The presence of urinary hKIM-1 can have important implications for the overall management of patients with renal tumors. We found a significant reduction of postnephrectomy urinary hKIM-1 levels. If postnephrectomy urinary hKIM-1 does not return to an undetectable range, then this finding may implicate an ongoing renal pathologic process, including a question of the presence of RCC in the contralateral kidney or other renal disease involving proximal tubules. This suggests that the reduction in hKIM-1 levels after nephrectomy for RCC may be prognostically useful for predicting RCC or other renal tubular disease in the remaining kidney. No reliable RCC urinary tumor marker is currently available with which to compare the usefulness of hKIM-1 in tumor detection. Several properties of hKIM-1, however, indicate its usefulness as a biomarker for RCC, especially for the clear cell type: (1) hKIM-1 is not present in normal renal tissue and is below the level of detection in normal urine samples; (2) hKIM-1 is a sensitive urinary marker for proximal tubule injury and thus hKIM-1 can be expressed in the presence of tubular injury from compressing tumor cells; (3) hKIM-1 is very specific for tumors of renal origin; (4) there is a strong association between the level of urinary hKIM-1 and the size of the tumor, which may be useful in overall prognosis; (5) urinary hKIM-1 is straightforward to measure and can be used as a noninvasive tool for the diagnosis of RCC at all stages of the disease; and (6) hKIM-1 expression in a lymph node metastasis suggests that hKIM-1 can be helpful in the tissue diagnosis of metastatic disease with unknown primary tumors. hKIM-1 may be a useful serum tumor marker. At the present time, we do not know whether hKIM-1 is present in serum of patients with RCC. Our preliminary data reveal that hKIM-1 can be detected in serum of patients who have acute renal failure and need renal replacement therapy (unpublished data). There are, however, formidable obstacles to the use of urinary hKIM-1 as a screening marker of RCC for the general population. Any noninvasive screening marker needs to have very high sensitivity and specificity before it can be useful because of low incidence of RCC. There are, however, subpopulations at high risk for developing RCC. Patients with localized, sporadic RCC have a 30 to 40% chance of relapse after nephrectomy (44). Patients with Von Hippel-Lindau disease have a 60 to 70% lifetime risk for developing multiple, bilateral clear cell RCC (45). Therefore, under selected situations, hKIM-1 can be used as a biomarker that, if detected, would trigger further evaluation for early RCC, contralateral kidney disease after tumor nephrectomy, or occult relapse. This early detection would lead to early removal of the tumor with potential sparing of kidney tissue and prevention of metastasis, thus reducing morbidity and mortality associated with reduced renal function. The absence of hKIM-1 in the normal urine makes its presence likely to be a sensitive and specific indicator for proximal tubule abnormality and would guide the clinician to further exploration for renal disease. In conclusion, we have demonstrated that the ectodomain of hKIM-1 can be detected in the urine of patients with renal tumors, in particular clear cell RCC, and may serve as an early urinary tumor marker for this often clinically silent disease. This work was supported in part by National Institutes of Health Grants DK39773, DK38452, and DK46267 (J.V.B.) and 5F32DK10036 and 5KO8DK64075 (W.H.). This work was presented in part at the 2002 (Philadelphia, PA, November 1 to 4, 2002), 2003 (San Diego, CA, November 14 to 17, 2003), and 2004 (St. Louis, MO, October 29 to November 1, 2004) American Society of Nephrology annual meetings and published in abstract form (J Am Soc Nephrol 13: 472A, 2002; J Am Soc Nephrol 14: 450A, 2003; and J Am Soc Nephrol 15: 501A, 2004). We acknowledge Veronique Bailly’s (BiogenIdec Inc.) work in generating the hKIM-1 mAb. Is Kidney Injury Molecule 1 a Valuable Tool for the Early Diagnosis of Contrast-Induced Nephropathy?